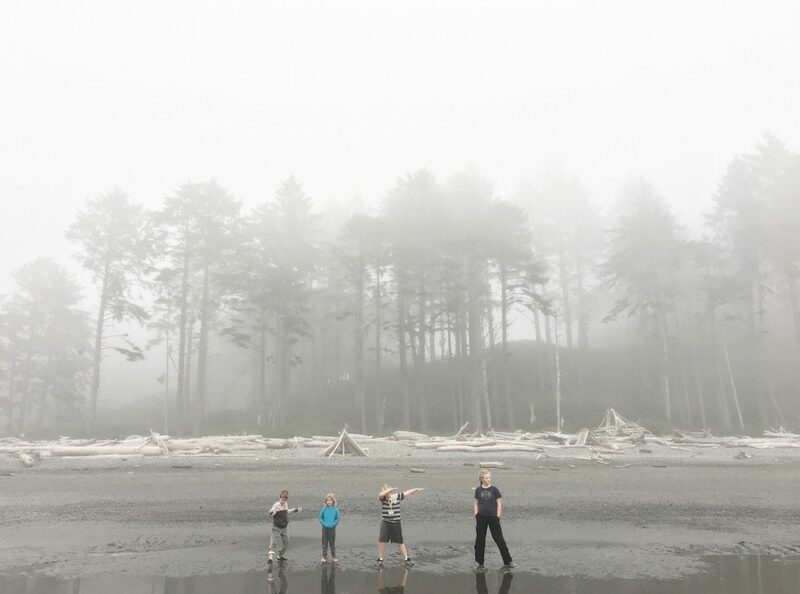 After our epic crabbing adventure in Nehalem Bay, OR we continued our journey up north to Olympic National Park! We had a quick 2-3 night stay on the way at another fantastic family’s property we got to meet through Boondocker’s Welcome. It was so nice of them to let us have a few nights to rest and get some work done before we continued north. I’ve said it before and I’ll say it again. We have met the best people through Boondocker’s Welcome and I am so glad we have this membership. You should totally invest in this one! After a few nights of rest, we headed north and made it to Olympic National Park. We found a sweet dry camping spot near the Hoh Rainforest across from the Hoh River and called it home for the week. We could not wait to explore! First up was Ruby Beach. Even the short walk to the beach was magical. The fog mixed with the lush greenery was pure eye candy. I knew from that moment this was going to be a place that would be hard to leave. We made it to the beach and had so much fun climbing over the drift wood and creating a ‘house’ out of the logs. It was the best playground ever. The dense fog made the beach all kinds of creepy and beautiful. We ventured out a bit to some tide pools and found some star fish (excuse me, I can’t call them sea stars). There were so many creatures to look at. The kids didn't want to leave! It was such a fun evening on the beach. I’m so glad we made the drive to the coast. While at the park we went on several hikes most of which were super crowded. We’ve found that most all of the National Parks we have been to this year have been so crowded. It’s really starting to make us want to just explore the areas near the park, but that’s a whole other blog post. We braved the crowds and got to see some pretty amazing sites. We have all decided that wherever we end up with our Shiny Tiny Farm, we have to have ferns! So many ferns, and it never got old to look at. Turn over some of their leaves and look for the red spores. It was so neat to see how perfectly lined up they were. God seriously makes the coolest stuff! Adali and I tried our hand at making French Baguettes for the first time while in the rain forest. We cooked some on the Green Mountain Grill, and some in the oven. We even took some loaves out to the beach for a (very chilly) evening tailgate picnic. We explored 1st and 3rd beach (we missed the turn for 2nd beach). We probably should have done some research before we headed there. We started down the path to 3rd beach and it took us a good 30-40 minutes to even reach the beach area. This beach wasn't even that awesome. It was much harder to get to and the beach its self was not that great. There were several people set up to tent camp out there though, and that would have been fun. Cold, but fun. We hiked, and hiked and were just in awe of this area. We didn’t even know there was a rainforest in the U.S. until a few weeks before we got here. It was so fun that the kids were able to read about it before we got there and then see what we learned about. This is the best part about our #tinyshinyhomeschool life. One of the last nights at the campground, the kids decided they wanted to sleep outside in the rainforest. We pulled out our Winterial tents and in no time they were ready to start up a fire and enjoy their first night alone in the tents. The next morning they were telling us about how they thought there was a bear outside and heard noises in the middle of the night. But they stuck it out all night and asked if they could do it again soon. I was a nervous wreck but we checked on them and looked out the window throughout the night and they were fine! I love giving them as much independence as we can. They love it and it’s so good for them to do things on their own. Even if it’s just right behind our RV. Of course while we were there, we were able to complete the Junior Ranger Program and they all earned their badges. This has been a pretty sweet spot and not sure how we'll top it. We packed up and headed to the north side of the park. Next up, Port Angeles!